Hornady's newly released Frontier line includes this powerful 5.56x45 ammo. Through a partnership with the Lake City Army Ammunition plant, Hornady has managed to create a military-grade cartridge that will blow away the competition on the range. 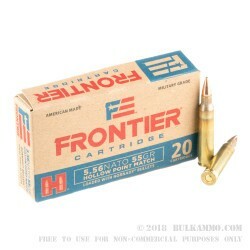 Fitted with 55gr hollow point Match bullets, these rounds offer precision at long range and carry a lightning fast muzzle velocity of 3240 fps. Each 5.56x45 cartridge is constructed using a Boxer-primed brass casing that is new and hot off the press. These cartridges are non-corrosive and reloadable so you can get every ounce of value out of this Hornady ammo. Joyce Hornady established his company in the post-WWII United States in 1949, and since then, the company has established itself as an innovative major player in the American ammunition market. Don't miss out on this exclusive chance to try their hot new offering. 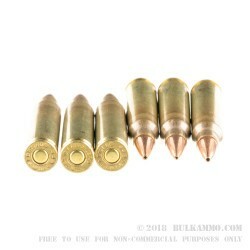 Order 20 rounds of this 5.56x45 today!